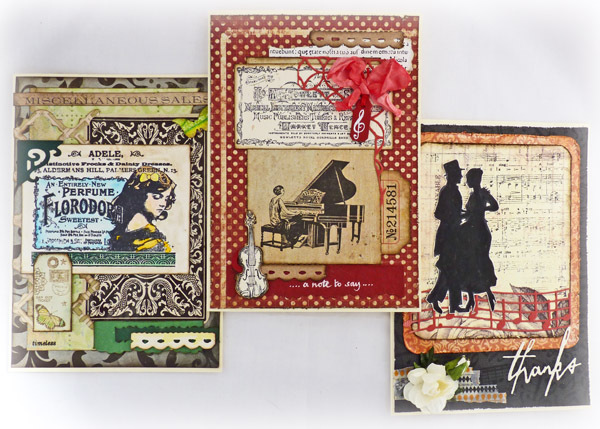 The monthly theme of 'Music to my ears' continues over at Crafty Individuals and I have made some cards for my DT samples linking with the music theme. 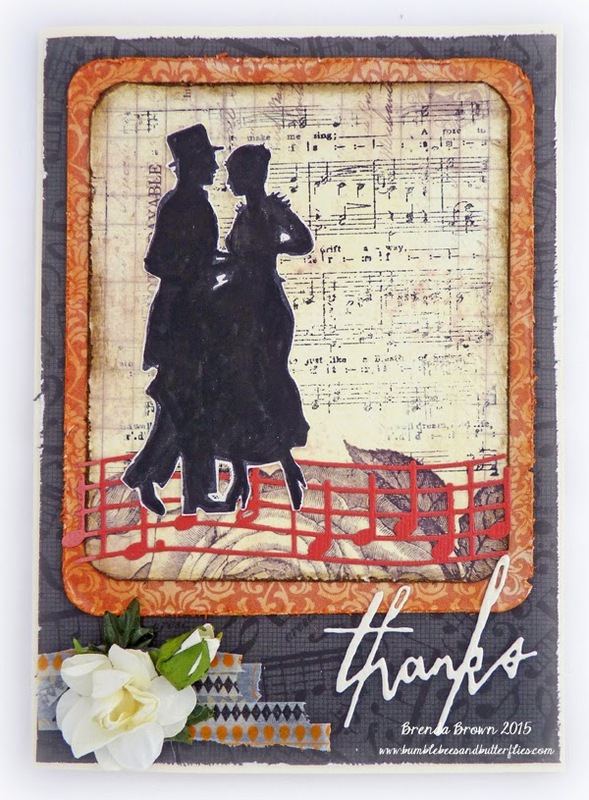 My 'Thanks' card uses stamp sets CI-377 where I cut out the silhouette dancers and CI-194 for the music background. 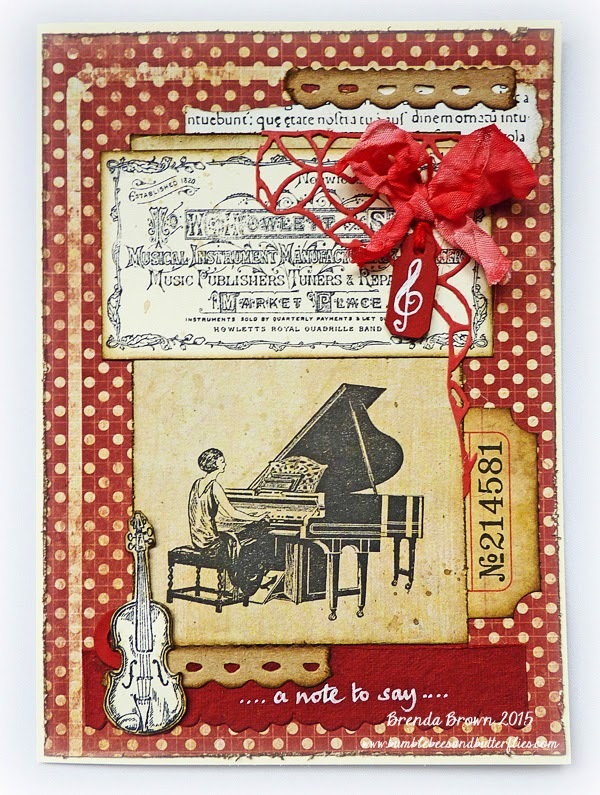 The music stave is a memory box die and the sentiment is Tim Holtz, although it's difficult to see the black background actually has music notation on it. 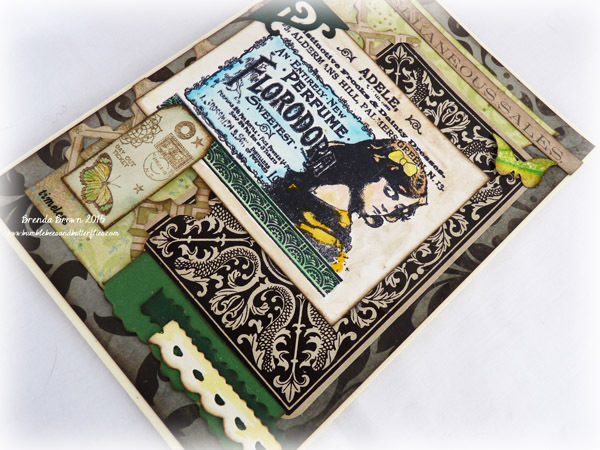 On my second card I have used the CI-366 stamp set and created layers with border dies and snippets from my scrap box. Now I am sure you can see the musical link to the previous two cards, but this next one it is more obtuse. Can you guess what it is? 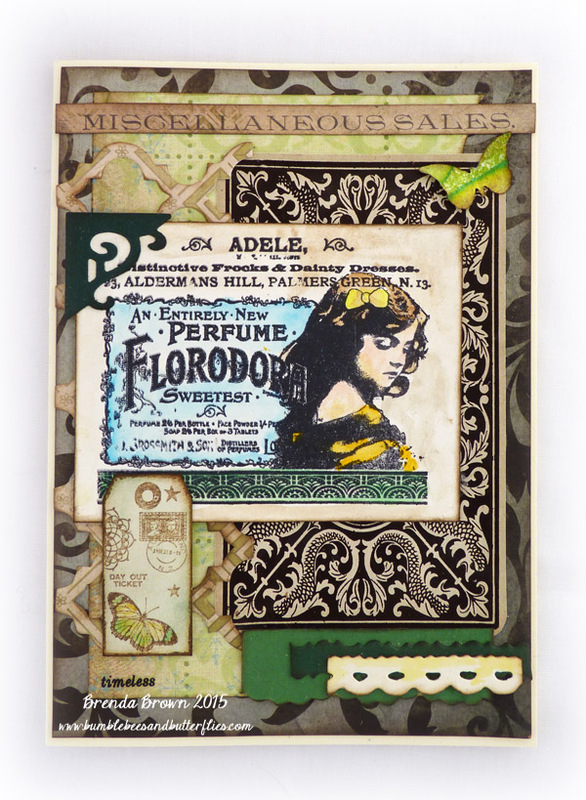 I couldn't resist creating a card using this beautiful collaged stamp of the pretty girl advertising perfume (CI-148 and CI-335), but take a closer look at the name of the shop. Is that a big enough clue? 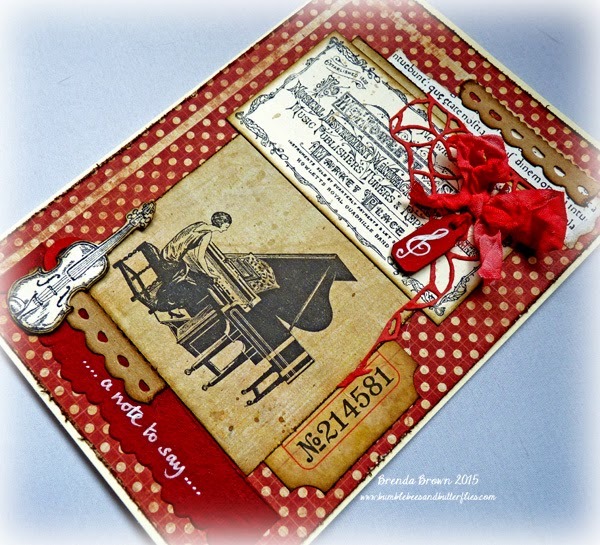 This card uses the beautiful Floradora girl stamp and the Woman's World tag set. I haven't added any overt references to music but as soon as I saw the stamp it resonated with me and I immediately saw a link to the challenge as the name of the shop where this perfume is sold is called Adele. I love Adele's music and have both her albums, so it fitted nicely in my brain lol. Jean as always is very generous with her prizes and offers so do pop over to the challenge post to see more amazing samples from the DT and find the details of how you can enter. A big welcome to all the new followers who have joined me recently, it's wonderful to have you aboard and to all my commenting and silent readers who stop by to see what I am up to, thanks for sharing in my creative journey. Take care, have a great weekend. I will be travelling back from my holidays today so I will update with some photos on my return. 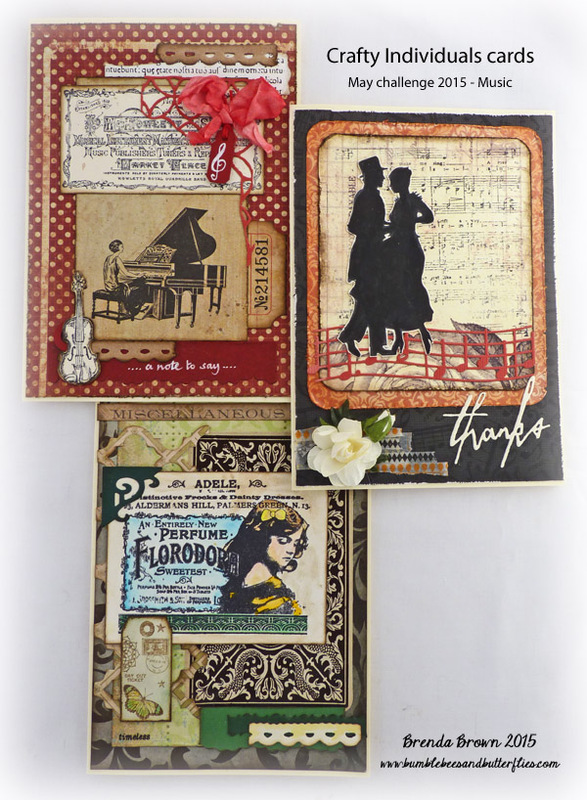 Beautiful assortment of cards, Brenda! I am particularly drawn to the last one, the Adele card. I caught that connection right away but also Florodora has meaning to me, too. I have an antique doll and her head mold is Florodora. She is special to me as she is the first antique doll I every purchased and that was about 35 years ago. Great cards Brenda, I can almost hear the music. Love the couple on the 'thanks' card. Oh my my my Brenda. These are INCREDIBLE. Way beyond my talents - for sure. Just INCREDIBLE. Of course, I love music - sing, play etc... so this is beauty to me no matter what but... there is not way to choose a fav. They are all FABULOUS. You should be sooooo proud of them. Anyone that was lucky enough to receive one of these would be THRILLED. Just WOW. j. What lovely musical collage pieces - the vintage images are just fabulous, and I adore music publisher's label... may just need to go in search of that! Fabulous cards. 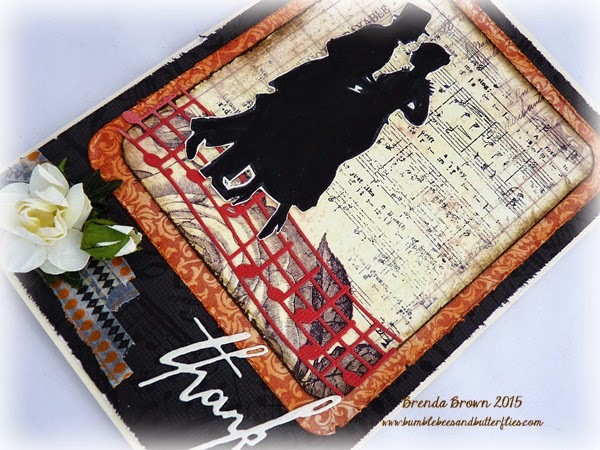 Wonderful cards Brenda, so many lovely layers and those stamps are beautiful. Looking forward to seeing your travel pictures, have a safe trip home! These are lovely samples, and would inspire many. Wonderful music themed samples, Brenda! Love all the wonderful layers as always! My Internet is still crawling like a snail!!! Hugs! We had the same idea with the "couple" stamp!